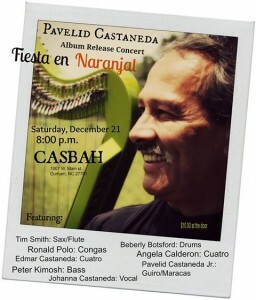 Chapel Hill harpist Pavelid Castañeda, originally from Bogotá, Colombia, will celebrate the release of his new CD: FIESTA EN NARANJAL, featuring original compositions that combine Latin American folklore and jazz. Pavelid’s son Edmar, himself an international touring artist based in New York City, produced the album and will make a rare trip to the Triangle to join his father in the ensemble. 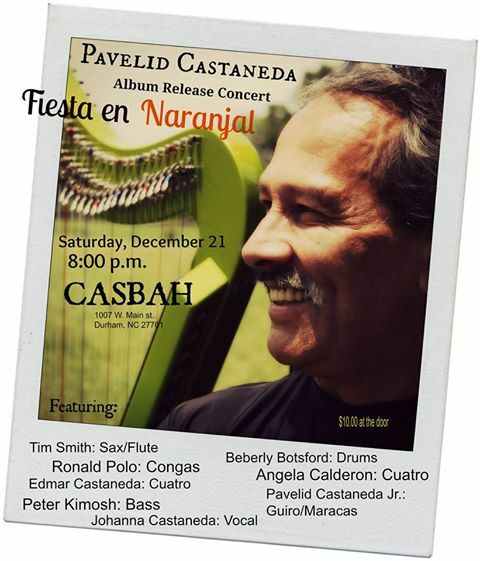 The show is Saturday, December 21st, at 8 PM at Casbah in Durham. Buy your tickets now! This entry was posted in Event, Media. Bookmark the permalink.